The 2016 Presidential Election will determine whether our nation moves forward building upon a hope and change agenda or moves backwards to a dark period of exclusion where the wealth gap continues to rise, the poverty rate increases, the middle class dissolves and voting rights are repressed for minorities, the elderly, immigrants and youth. In 2016, there is much at stake when the nation will elect the 45th president, 435 members of the U. S. House of Representative, 34 U. S. Senators, 12 state governors and 88 of the 99 state legislative chambers; and 41 of the 100 largest cities and municipal governments. The National Coalition on Black Civic Participation (The National Coalition) will celebrate the 40th Anniversary of its founding in 2016focused on organizing, amplifying and leveraging the voices and impact of the Black vote in the 2016 Presidential Election Cycle through its Unity 2016 Civic Engagement & Vote Empowerment Campaign (Unity’16 Campaign). The National Coalition created the Unity Campaign model in 1998 to reinvigorate its 80 membership organization base, 12 state-based affiliates, Black Women’s Roundtable and Black Youth Vote Networks. The Unity Campaign model was also designed to cultivate new partnerships and develop new ways to attract and share resources. 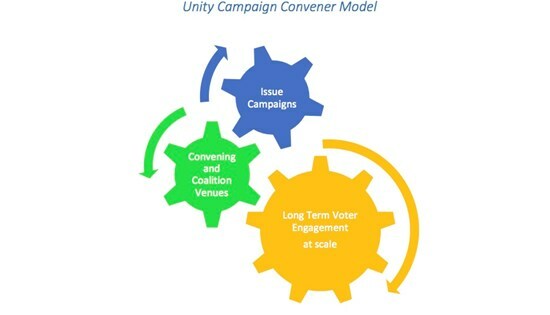 What makes the Unity model unique and effective, is the ability of The National Coalition to maintain a coordinated, constituency-based integrated voter engagement campaign year-round utilizing national and state based coordinating committees. The Unity ’16 Campaign seeks to usher in a new balance of power by developing leaders and electing champions who will promote policies that improve the quality of life in Black and underserved communities. Mobilizing a universe of over 400,000 Black voters and ensure they cast a ballot. Manage the Unity Ronald W. Walter Election Command Center to provide support to the on the ground team and partners to facilitate media, solve problems and provide research. Host Post Election media briefings to highlight key findings from 2016 Election (nationally and in key states) and Unity ’16 Campaign Preliminary Report in December 2016 and Final Report in 2017.